bloodmobile. Long Beach... Air Bos'n's [sic] mate 3/c Louis Farino, 19, 221 El Dorado street, Arcadia, is first of Aircraft Carrier Philippine Sea to volunteer to donate a pint of blood as Capt. Elvin L. Farrington, commanding, looks on. Volunteer worker seated near Farino is Mrs. Florence Rothenbach, volunteer worker at typewriter seated near Capt. Farrington is Mrs. Martis Thompson of Long Beach. If other volunteer workers show they are from Mrs. Thompson clockwise Mrs. Bea Uselton, Mrs. Irene Winfield, Mrs. Alma Torkleson. First contingent of crew offering blood is shown in background. 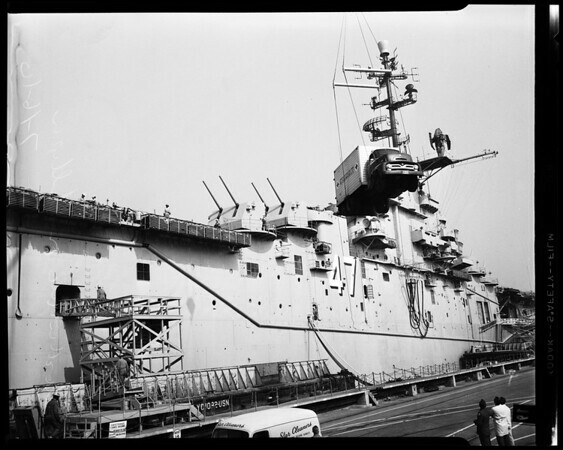 Other shots show bloodmobile being hoisted aboard Aircraft Carrier Philippine Sea at Long Beach Naval Shipyard".